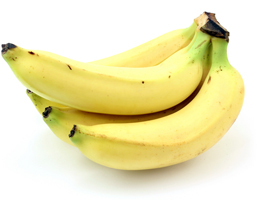 Based on the wholesale price of bananas, the Dow currently buys you a whopping 15.35 tons of the tropical fruit. But this is exactly the same amount of bananas the Dow would buy back in February 2008, when the Dow was just 12,266. And it’s a massive 60% drop from June 1999 when the Dow bought 38.51 tons of bananas. While investors are cheering the new nominal high in the Dow or S&P 500, they fail to grasp what is happening to their purchasing power. Buffett always said THE goal of an investor is to maintain his or her purchasing power. At the end of your investing period will the dollars obtained after selling your investment bring you the same amount of “bananas” as your dollars would have obtained at the beginning of your investment period. The CPI-U (consumer price index) is the broadest measure of consumer price inflation for goods and services published by the U.S. Government’s Bureau of Labor Statistics (BLS). 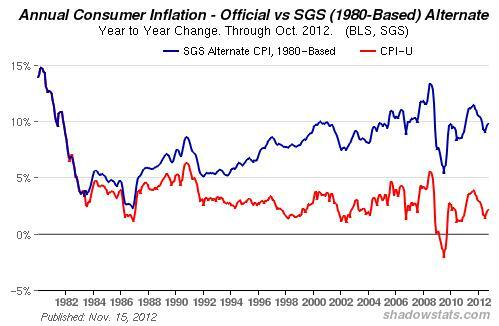 The chart below shows the Shadow Government Stats -Alternate CPI estimate. It figures inflation based on our own government’s official methodology for computing the CPI-U in the years through 1980. Under the old rules US inflation has been in the double-digits for much of the preceding five years. The ‘new’ BLS numbers want you to believe price increases since 2008 have been quite mild. The Bureau of Labor Statistics also uses a technique called ‘substitution’ to hold down their reported inflation figures. If an item in their index goes up in price they can assume consumer would simply trade down to something cheaper instead. If your favorite rib-eye steak went from $7.99 to $12.99 per pound you’d simply eat hamburger instead. Have those organic bananas gotten too expensive. Try prunes. Need a replacement for your Lexus? Buy a Kia instead. Presto, there’s no inflation evident in any of those situations according to the BLS. http://www.beatingbuffett.com/?p=4436 Individual investors making poor decisions. http://marketshadows.com/2012/12/31/covered-calls-the-hidden-risk-for-2013-and-beyond/ The danger of selling covered calls now.